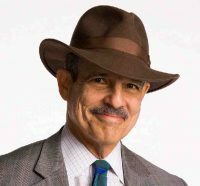 Paul Solman frequently answers questions from the NewsHour audience on business and economic news on his Making Sen$e page. Friday’s comes from a reader at Next Avenue. The NewsHour has partnered with Next Avenue, a PBS website that offers articles, blogs and other critical information for adults over 50. Nick Estes — Albuquerque, N.M: Is it true that running federal budget deficits during present conditions increases a harmful debt burden on our children? If so, could you explain how since Treasury bonds will also be assets to them? Thanks. Paul Solman: An excellent point, Nick, masked as a question. But whatever your motivation, the answer depends in part, at least, on who owns how much of the U.S. Treasury debt. Let’s start with the scare number : $16.5 trillion. That’s the total tally of U.S. Treasury securities issued to date and not yet redeemed — Uncle Sam’s IOUs, that is, coming due in days, weeks, months and years. For the most frightening and discombobulated presentation of this number, updating maniacally in real time, go to the usdebtclock.org. Those interested in a simpler breakdown of the numbers may prefer usadebtclock.com. 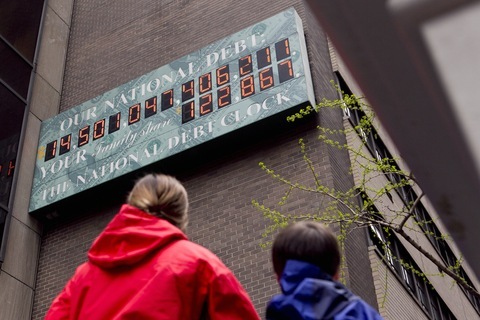 And the chill among you will opt for this debt clock. But the headline number remains the same wherever you look : $16.5 trillion (rounded up slightly). So who’s holding the IOUs? Well, first of all, the government itself. Just about $5 trillion of the total is in the form of so-called “intragovernmental” holdings, mainly the Social Security and Medicare Trust funds, roughly $3 trillion, and Federal employee pension and health insurance programs, just north of $1 trillion. This is so-called “non-public” debt: money the government owes to itself. Typically, when you see the ratio of debt to GDP reported at around 70 percent, it is total debt minus the “intragovernmental” chunk. Including debt to ourselves, the number would be about 100 percent. By the logic of excluding what we owe to ourselves, though, it might seem reasonable to exclude the Federal Reserve’s holdings as well. That’s another $1.7 trillion or so that one branch of the government owes to, in effect, another branch, since the Fed holds about $1.7 trillion dollars worth of Treasurys. I don’t mean to debate the issue, however, just clarify to whom “we” owe money. For those keeping score, if you tally up Fed holdings plus all trust funds, we’re now up to about $6.7 trillion of the $16.5 trillion total — all to ourselves. And we’re still not done with what you might call “intra-American” debt. That’s because a next big tranche, as they like to say on Wall Street, is also held by or on behalf of citizens of the United States. State and local governments, for example, including their pension funds, hold about $700 billion; mutual funds, nearly $900 billion; private pension funds, $600 billion; banks, $300 billion or so; insurance companies, $260 billion. Add in personal holders of U.S. savings bonds — another $185 billion — and individuals, government-sponsored enterprises, brokers and dealers, bank personal trusts and estates, corporate and non-corporate businesses, and other investors in Treasurys, and you’ve got an additional $1.4 trillion or so. Hit the calculator: $4.3 trillion more in money Americans essentially owe — to Americans. Grand subtotal thus far: $11 trillion — two-thirds of the total. So who’s holding the rest? Let me pause for you to guess. Right: foreign creditors. They’re holding about $5.5 trillion worth of Treasury securities. These include the infamous bond hoard held by China, for example. You’ve surely heard the story: the Middle Kingdom could supposedly, if angered, dump on the bond market, driving up U.S. interest rates. But in fact, China holds no more in U.S. Treasurys than does Japan: just over $1 trillion each. You can see the total list for yourself here, though you may want to take a crack at the top ten first. Russia above Germany, do you suppose? Singapore more than Switzerland? Check it out. But details aside, the foreign total is, as I say, about $5.5 trillion, about a third of the total total. So, finally, the answer to your question, Nick: If by “our children” you mean the next generation of Americans, they are holding, at least implicitly, the substantial majority of our national debt. It is the government’s liability; it is their asset. Yes, if taxes rise to pay off the interest and principal, the next generation will be on the hook. But mostly, you could argue, they will be paying themselves. Especially to the extent that today’s American holders of Treasurys bequeath them to their children.